As Rahul Gandhi and Narendra Modi battle it out for the 2019 elections, Indian liberals’ hold over language will also be severely tested. Political commentators routinely place the adjective ‘polarising’ in front of Prime Minister Narendra Modi’s name, but no one uses it for Congress president Rahul Gandhi. The prefix ‘polarising’ fits Rahul Gandhi just as much. The word ‘polarise’, according to the dictionary, means something or someone who splits or divides people into two opposing factions. Narendra Modi and Rahul Gandhi are textbook examples of this adjective because they both evoke extreme love and revulsion. You mention their name in front of a group of people and you will, most likely, part the room into two passionate camps – fawning supporters and angry detractors. Let’s see how the two leaders measure on the polarisation index. Rahul Gandhi’s supporters talk about how he has upped his political game in recent years, how he is active on Twitter, is a better orator now, how he delivered victories in Rajasthan, Madhya Pradesh and Chhattisgarh, and how he is essentially a decent man who wants to preserve pluralism in India. But his critics will bitterly attack the Nehru-Gandhi dynasty as the epitome of privilegentsia. They talk about Congress governments’ corruption scams, Robert Vadra’s rise, the lost decade (2004 to 2014) that Rahul Gandhi wasted in dithering and his multiple soft launches. While Modi’s supporters talk about his clean image, strong leadership, strident Hindutva, surgical strikes and oratory, his opponents point to his Hindu fundamentalist politics, economic and foreign policy mishaps and the 2002 Gujarat riots. But both of them have participated in the political theatre of the absurd. And some of their acts have been deeply polarising. For instance, when Rahul Gandhi tore up the ordinance papers in 2013, or said that Congress leaders were not involved in the 1984 riots; or when Modi spoke about ‘shamshaan vs kabristan’ in 2017, or recently joked about people with dyslexia. I too have used the prefix ‘polarising’ for Narendra Modi when I was with The Washington Post. In 2013, a reader posted a comment asking me why I used that word for such a popular leader. I began to write a reply to the reader, but found that my explanations could have suited Rahul Gandhi, Lalu Prasad Yadav, Mayawati, Mamata Banerjee and Arvind Kejriwal too. The traditional understanding of the word polarising in the Indian commentariat is that it describes Right-wing politicians and the divisive nature of their politics. Now, some readers, especially the Congress voters, will accuse me of perpetuating a false equivalence between Narendra Modi and Rahul Gandhi. They would like to see Rahul Gandhi as a ‘secular’ unifier and Narendra Modi as a Right-wing divider. But outside India, ‘polarising’ is used as an ideology-neutral term for both the Right and the Left. And, curiously, even for the Centrists, of late. When former Venezuelan president Hugo Chavez died in 2013, both The New York Times and The Washington Post used the word ‘polarising’ in the headline for their obituaries. “Mr. Chavez left Venezuela deeply polarized, his supporters lionizing him as a courageous rebel determined to take on the elites, and his foes painting him as a dangerous demagogue and strongman,” The Post said. Of course, Brazil’s current far-Right president Jair Bolsonaro, US President Donald Trump and French Right-wing politician Marine Le Pen are routinely called polarising. The international media goes a step further. Can politicians who situate themselves in what was once called the “extreme centre” be labelled “polarising”? You can’t get a leader more Centrist than French President Emmanuel Macron. In fact, when he campaigned two years ago, the phrase ‘radical centrism’ was used to describe his muscular-middle politics. A Gallup poll in 2015 called both Barack Obama and George Bush as the two “most polarizing” US presidents. Even Hillary Clinton was called a polarising politician. But in India, even the extreme Left voices are rarely called ‘polarising’. This is because the liberal and Left intelligentsia, who were the unchecked gatekeepers of language for the longest time, put the word in the Right-wing box. All politics begins with language, and is embedded in its biases. Author Malcolm Coxall wrote in his 2013 book Human Manipulation that language is not a neutral conduit, but impressions and concepts that are stored in the ‘information bins’ of our memory. “Playing games with language and laying linguistic traps are popular pastimes of politicians and politically motivated media outlets,” the book said. A 2015 The New York Times article about Hillary Clinton being called ‘polarising’ discussed the word and how it became an ‘unfortunate vogue’. That brilliant coinage has now been newly re-minted as the Trump Derangement Syndrome. Perhaps it is time to import it to India for the two polarising leaders Narendra Modi and Rahul Gandhi. There are too many voters who have been so immobilised by their Rahul and Modi derangement syndromes that they now resort to using the euphemism of the TINA factor. Also read: What do Modi haters say when confronted with the TINA factor? As Rahul Gandhi’s NYAY and Narendra Modi’s PM-Kisan battle it out in the crucial 2019 elections, Indian liberals’ hold over language and ideas will also be severely tested. The Indian commentariat needs to shed its bias and acknowledge the new realities. Thank you Tejas, Ashok and Yamini for your comments – you have already said all that i felt reading the article. Rahul Gandhi may have his faults (and who does not? though Bhakts believe Modi has none) but deliberate polarization is definitely not one of them. To the Gandhi worshiper, As i mentioned earlier, it has been inherited from Rajiv Gandhi’s time, reversal of Shah Bano judgement that create Muslim appeasement image. To change that image he was the one who bring Ram Janmbhoomi dispute in to limelight by arranging Pooja on the vanue by opening the gates which was closed up to that time.. That gave BJP an opportunity to make Ram mandir issue in a big way. ‘Polarising’ was always a British tradition that Congress faithfully adopted as they believed it got them “Votes”; the’Hindu’ vote being taken for granted. It was only after the BJP began demolishing Congress citadels everywhere that they actually remembered ‘Hinduism’. This descended to its nadir when Rajiv Gandhi was the PM, with the reversal of the Shah Banoo verdict and, worse, as if to compensate for that and appease the Hindus, opening up of the Ran Janma Bhoomi. Now, Rahul Gandhi has taken this polarising to its worst ever depths in Congress history, with their “Janeu Dhari” spree of’ Temple visiting on election eve’ credentials.. It is very strange that they should blame Modi and the BJP without opening their eyes to what THEY are actually doing. Bravo. Well said! Congress’s vote bank politics which the feckless dynast is trying to desperately rejuvenate is the ultimate in polarisation. Fair analysis, ‘because the liberal and Left intelligentsia, who were the unchecked gatekeepers of language for the longest time,’ would not write something like this. 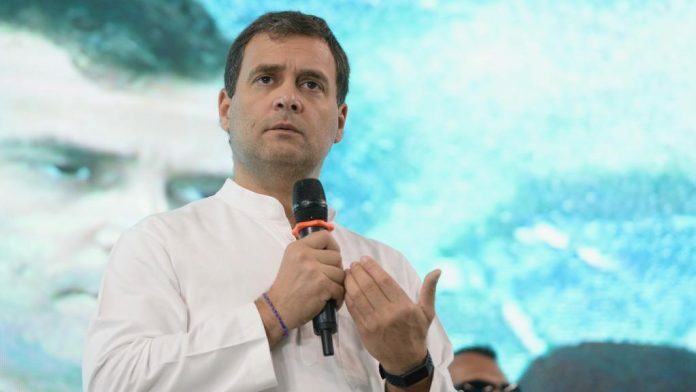 However, in recent times, the polarising against Rahul Gandhi (mainly on account of his ‘Pappu’ image) has softened in comparison to against his counterpart. Many of the friends of NM, especially among the more thinking people, have now become less friendly, neutral or even hostile, though their number in electoral terms seems insignificant. In perception politics it can still dent BJP and benefit Congress. On the other hand, among the large poor and common people the polarising seems to be in favour of NM. The article points out some great facts about other leaders but it the claim about Rahul Gandhi would have been better justified had there been more examples of his ‘polarizing’ mannerisms. If one divides society into liberals and illiberals – there must be lots of people in between as well – it is evident that the members of one group will be fond of their leaders and averse to those who head the other side. To that extent, both leaders could be considered ” polarising “. However, I don’t think that would be fair to either language or substance. Politicians don’t have to be Munnabhais, one is not sure how much hugs work in real life, in eithet politics or global diplomacy, but hatred is not an emotion that should be part of democracy. To be fair to the Congress President, he has not referred to any group of his countrymen with derision, thought of them as being anything less than complete citizens, indicated to his followers that they are fair game. Somehow one cannot visualise Shri Rahul Gandhi as a polarising figure. Whether he becomes Prime Minister will be decided not by his genes – although they give him a huge leg up – but by the Indian people in a free and fair election. Extremely disingenuous comparison by the author, who calls Rahul Gandhi “polarising” based on the hatred some people have for the Congress party. The author doesn’t even specify which dictionary was used: the Oxford dictionary says to polarize is to “divide into two sets of opinions or beliefs”. In that context, Rahul Gandhi is simply a generic Congress chief, which incidentally also means he is from the only party acceptable to (if not currently loved by) every major social group in the country. Having detractors is one thing, and separating or “polarising” society into a set of immediate identities is completely another. No one dislikes Gandhi for his policies, or his personal traits/ideologies. They hate the Congress, and he represents it. The author should seriously consider looking up Lohia’s “anti-congressism”, it’ll prove there’s nothing new about this.